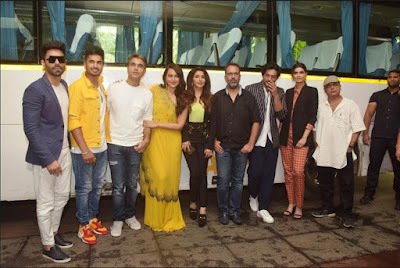 Film Udyog Se: Eros International & Colour Yellow Productions launch the trailer of Happy Phirr Bhag Jayegi! While Diana Penty's popular character 'Happy' from Happy Bhag Jayegi went missing and was later found in Pakistan, the makers – Eros International and Aanand L Rai’s Colour Yellow Productions were once again in a fix over the missing of another Happy (Sonakshi Sinha) but with the help of the media this time, they eventually found her in Mumbai. Interestingly, the cast of the film including Ali Fazal, Piyush Mishra and Diana Penty along with the media went searching for Happy in a happy van, especially designed for the film’s promotional campaign. Much to their surprise, they found Happy at a plush hotel in Mumbai where the trailer of the laughter riot was launched. Producer Krishika Lulla of Eros International says, “The script of the sequel was happy and hilarious enough for us to back it. When I heard the narration, I realised all the characters are so real that I actually felt I'm part of the happy and crazy world." Says producer Aanand L Rai of Colour Yellow Productions, “Before we started working on the sequel, I was sure that this film will bring me, and everybody associated with it, double the happiness as compared to the first part. I always wished to work again with the team of Happy Bhag Jayegi without even knowing about the sequel and I'm glad we collaborated again for Happy Phirr Bhag Jayegi." Director Mudassar adds, "When I wrote Happy Bhag Jayegi, it was a small attempt and we didn't realise that the film will receive so much love and support from the audience. The sequel is also made with the same honesty and simplicity but with double the madness, double the fun and crazy characters."